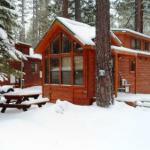 Located in South Lake Tahoe this rustic resort features individual cottages in a quiet and secluded atmosphere. Each cottage includes a full kitchen. The spacious cabins at Cedar Pines Resort offer laundry facilities a fully equipped kitchen and a living room. A sofa bed and cable TV with a DVD player are also available. Guests can take advantage of bikes for hire and barbecue facilities. Biking and hiking trails can be found from the resort and skiing is available nearby. Lake Tahoe Airport is 2.4 km from the Resort Cedar Pines. Emerald Park State Park is 5 minutesâ?? drive away. Lake Tahoe Balloons is 10 minutesâ?? drive from the property.